As an electrician in South Bristol and surrounding areas, I work in many homes where children live. From expectant parents preparing the nursery for their new arrival to families with teenagers who have all manner of electrical appliance is their rooms. The truth is, we never really know for certain what our children are doing from one minute to the next, and a simple mistake where electricity is concerned can cause electrical injury or worse still death. When I carry out quotation visits in South Bristol and surrounding areas, I unfortunately see some cases where DIY electrical work has been attempted in children’s bedrooms and as they grow older, the risk of electrical injury increases. In fact, I would say that over a quarter of family homes I visit, I see evidence of potentially dangerous electrical DIY. From incorrect wiring, to the wrong size cable being used, the risk of electrical DIY danger increases with young children around who are already likely to become curious where sockets and electrical appliances are concerned. The plastic plug that ‘protects’ against little fingers going into the socket pin holes. These can be fiddly for adults to remove, but it many cases, not so for curious toddlers! This has led to misplacement of the plastic plug therefore opening up the shutters on the bottom two holes. If you take a look at the sockets in your home, the bottom two holes will be closed off. This means that access to live parts is being prevented. UK sockets are safe so long as plugs and covers are kept away. The decision to have RCD protection in your home is entirely your own. Here at JPS Electrical Services, I always advise having your current fusebox tested for safety before you decide. If it is very old for example, if it has a wooden back, then a replacement would be advised. However, if your fusebox is relatively modern, but still safe, then you might decide to save your money. 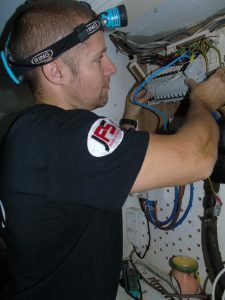 Fusebox upgrades should always be carried out by a qualified and registered electrician. If your home doesn’t have RCD protection, you could opt for plug in RCD protection. This is an RCD that an appliance is plugged into which would then offer RCD protection to the user. I always recommend that plug in RCD protection is used when using electricity outside such as when mowing the lawn, however this could be extended to include electrical items used by older children in their bedroom. The cords of appliances always seem to be a grabbing opportunity where toddlers are concerned. Remember children’s skin is far thinner than an adults and burns from appliances such as irons can be a serious matter. Take particular care of cords on hot items such as kettles, hair straighteners, hair dryers and irons. It is possible to purchase appliances with curly flex (like the wire on telephones) which prevents the cable from hanging down to a toddlers level. Even a charger left plugged in by accident can lead to electrical injury if a young child puts the end in their mouth. Never leave hot appliances unattended and take care of items left on standby. If any electrical item is plugged in, it presents a danger to young children. Washing machines, tumble dryers and dishwashers present frightening temptations for children who could climb inside. Some large kitchen appliances have a built in child lock which prevents doors from being opened by young children. Child locks can also be fitted to these types of appliances to prevent doors from being opened by children. Never leave doors to such appliances open and if possible unplug when not in use. I also recommend the use of an RCD plug in these appliances as they are often left unattended when in use. They can cause injury if tampered with and if a fault develops, it could cause an electrical fire. Older children will be in a hurry to leave the bathroom before they are dried off properly. Running to the TV to quickly to switch it on could lead to electric shock or injury. Always ensure that children are dry before they have access to anything electrical. This is also the same following water sports in the garden! Drinks spilt over electrical items such as games consoles, computers, sky boxes and DVD players will ruin them. Not only that, your child could receive an electric shock. If you are concerned about the safety standard of your home electrics, please contact your local qualified and registered electrician as soon as possible. They will be able to carry out the necessary tests to determine if your home is safe and advise on the next steps.